Man gets nail stuck in brain without noticing | UNBELIEVABLE! 34-year-old Dante Autullo accidently shot himself in the head with a nail gun in his Chicago workshop when the device recoiled unexpectedly. However, he carried on as normal and didn’t notice anything was wrong until the next day, when he began feeling nauseous. 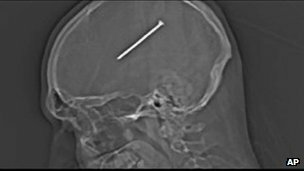 It turns out the 3.25 inch nail had penetrated his skull and embedded itself in his brain. It took surgeons two hours to remove the nail. Mr. Autullo took the opportunity to post his x-ray photograph to Facebook (pictured above) while in the ambulance. The reason why anyone can take a nail to the brain and suspect nothing is because the brain does not contain any pain-sensitive nerves, which means the brain is an organ that feels no pain. … But don’t try this at home to prove it to yourself. Posted on January 21, 2012, in Biology and tagged brain, Chicago, Dante Autullo, injury, medical miracle, nail, yuck. Bookmark the permalink. Leave a comment.